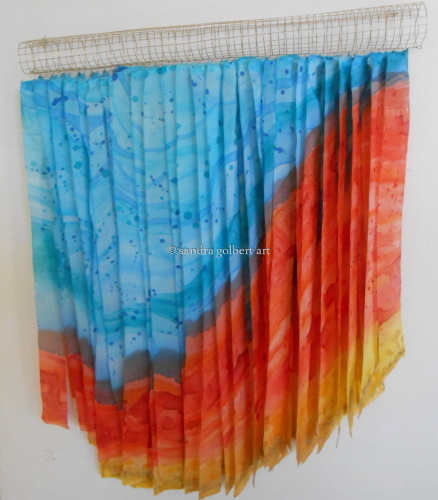 Mushroom machine pleated silk on base. 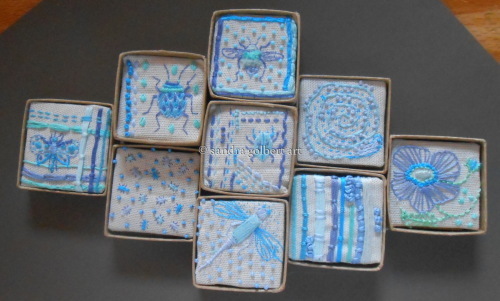 Small boxes filled with embroidered images mounted on silk or linen. 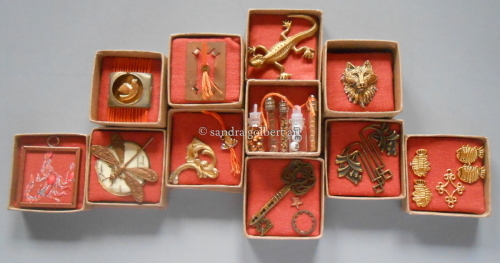 Some are made with found or created objects. One of a kind. May be ordered with clients' memorabilia, photos, etc. in many dimensions. 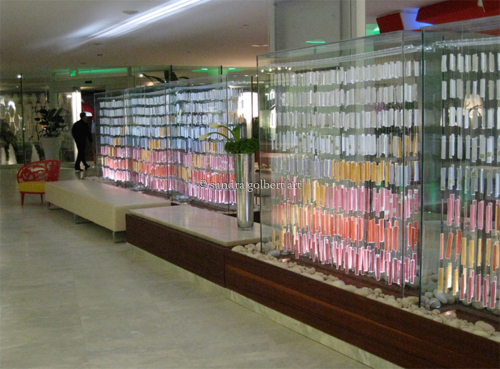 Installation in the lobby of La Concha Hotel in San Juan, PR. 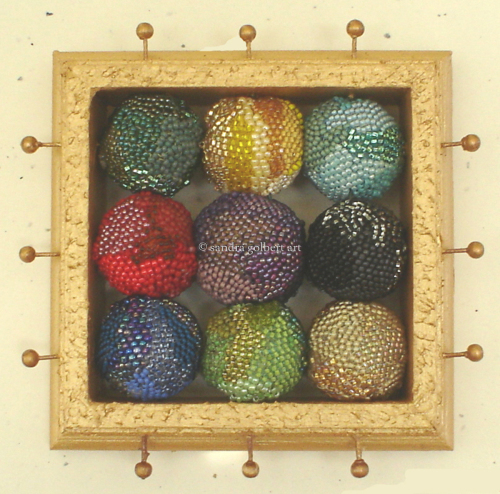 It consists of approximately 7000 pieces of hand-dyed silk pieces, threaded and hung on acrylic poles. There are 8 glass cases 6' square and 2' deep. The name, 'Amanece', (Dawning) comes from a song whose lyrics describe a farmer leaving the mountains at dawn with his harvest to go to market. 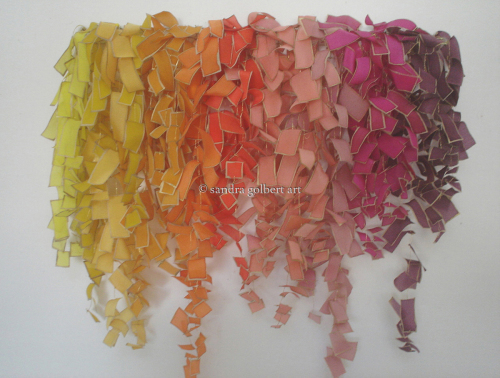 Hand-painted silk strips with gold edges (resist), colors from yellow to wine. 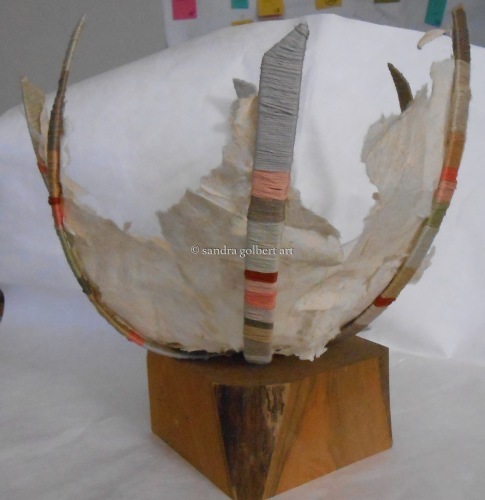 Hand-made paper over Christmas light holder (in box when lights are purchased). 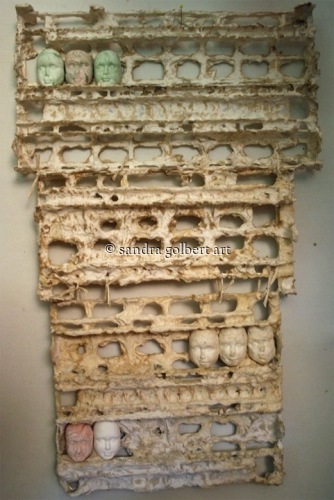 Molded faces - paper pulp. 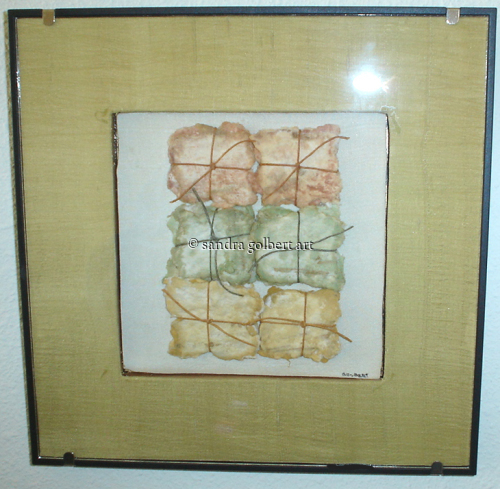 Wool, cotton, silk, rayon threads, cotton batting on silk-covered frame. 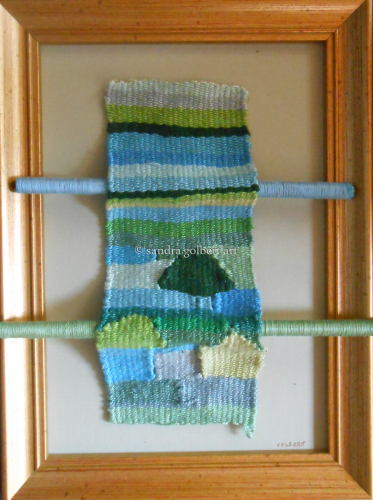 Embroidered, woven, manipulated. Wrapped cotton cords. 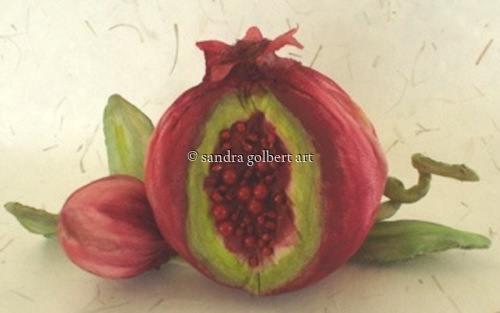 Silk sculpture of a pomegranate, dyed, painted, embroidered and beaded. 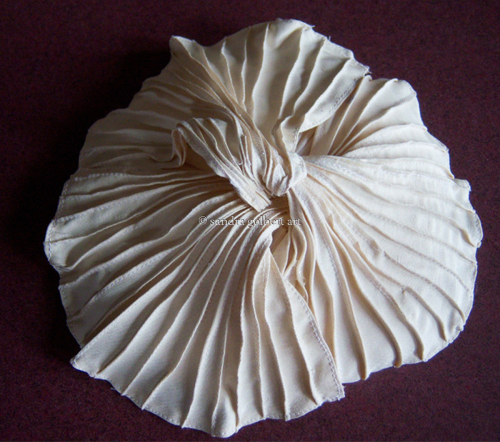 Hand-made paper, rolled. singed, stacked. 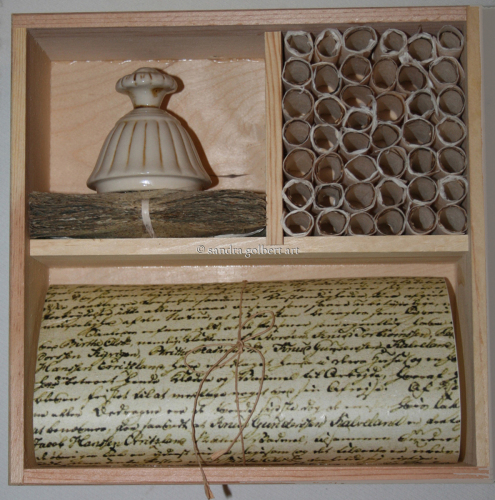 Copy of document, with ceramic piece representing inkwell. Wooden box. 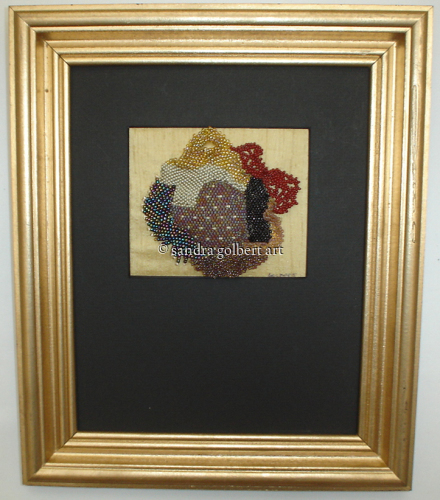 Hand-beaded, Japanese seed beads, other beads, mounted on silk in gold frame. 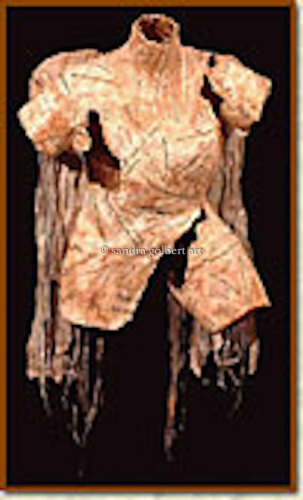 Painted, dyed, quilted, and appliqued silk, with silk and metallic old threads. 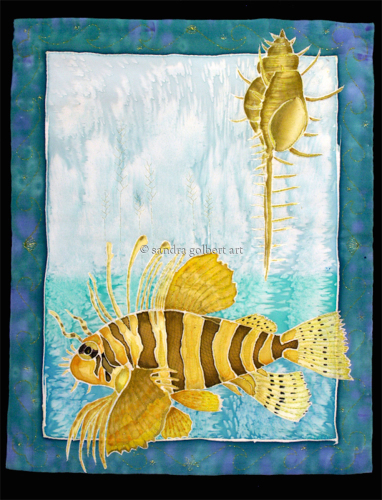 Made with Lionfish Quilt. 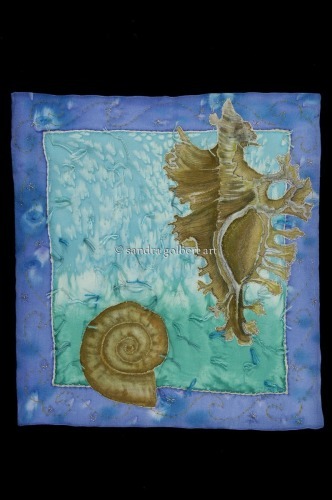 Painted, dyed, quilted, and appliqued silk, with silk and metallic old threads. 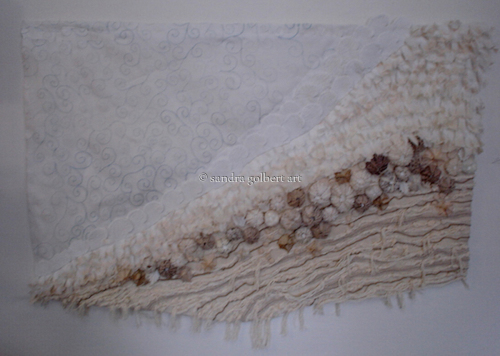 Made to hang with Shell Quilt. 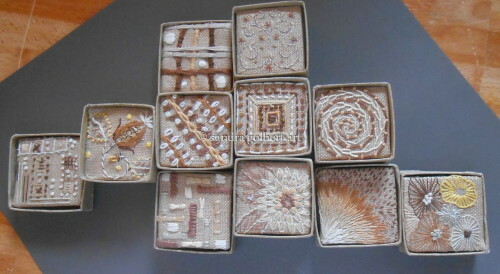 Small boxes filled with embroidered images mounted on silk or linen. 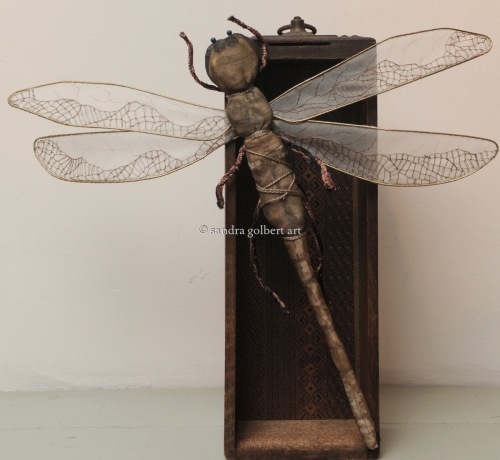 Some are made with found and created objects. One of a kind. May be ordered with clients' memorabilia, photos, etc. in many dimensions. 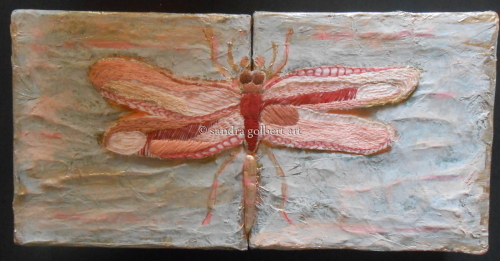 Hand-made paper, with cotton perle thread covered strips of wood. Mounted on wood block. 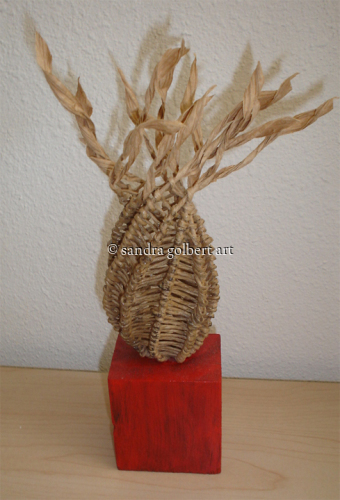 Paper rush basket on red wooden block. 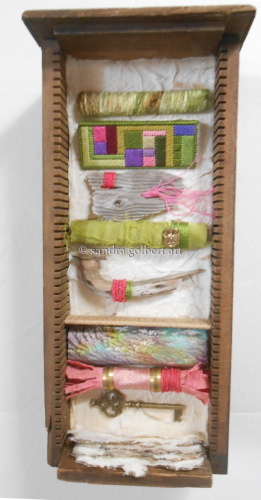 Small boxes filled with found and created objects mounted on silk or linen. One of a kind. May be ordered with clients' memorabilia, photos, etc. in many dimensions. 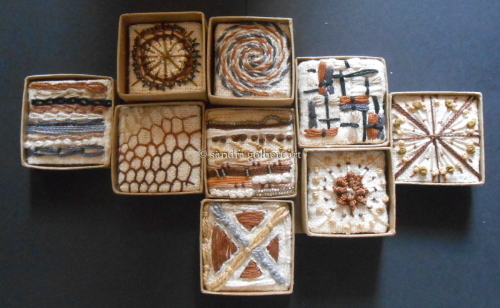 Wood, polymer clay, hand-cut paper in an antique trunk drawer. Fabric body, wire and silk organza wings embroidered. Antique sewing machine drawer. 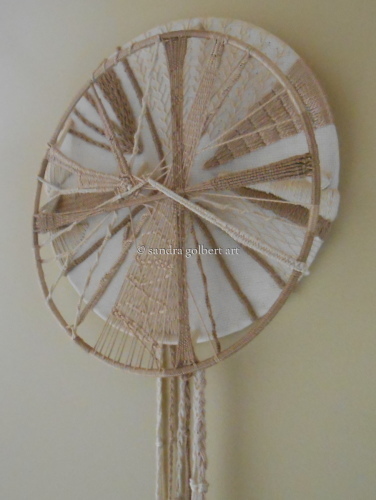 Machine pleated linen on wooden reeds, tied with waxed linen, constructed on wooden strips. 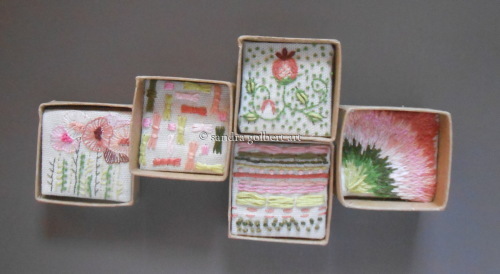 Wooden box with hand-made paper book inside. 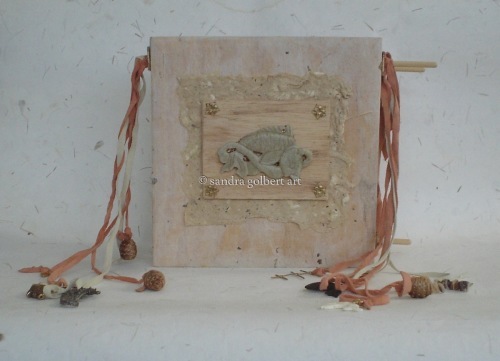 The theme of this mixed-media artists' book is 'fishy'. Cast paper, computer generated text, gold paint, gauze. 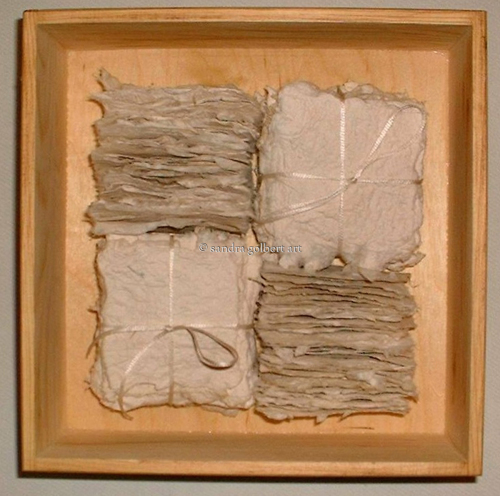 Packets of hand-made paper, tied with silk ribbon inside a wooden box. 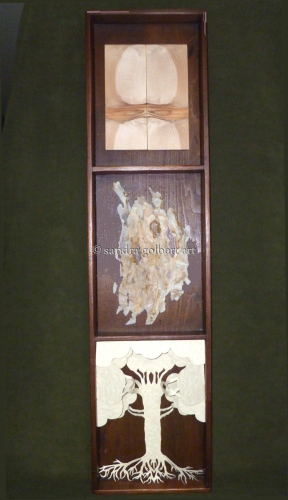 Mixed media inside antique wooden slide drawer. 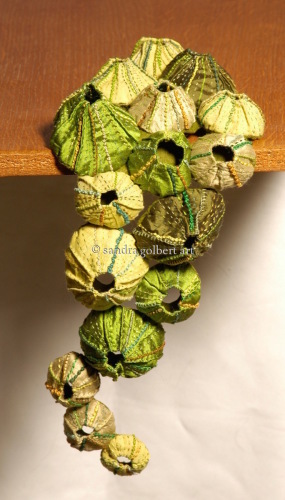 Green French silks, embroidered. 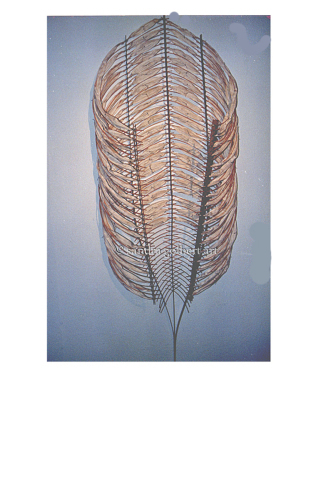 Piece hangs from the edge of a shelf. 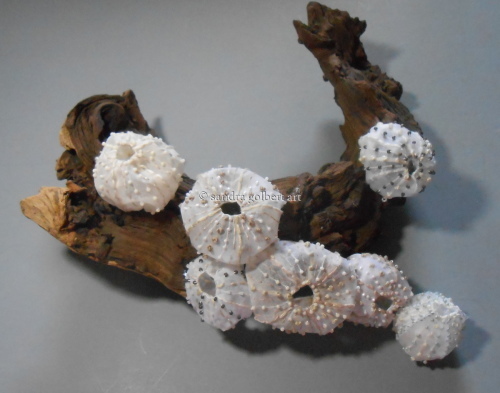 Silk organza urchins, embroidered, beaded and draped over a wooden branch. 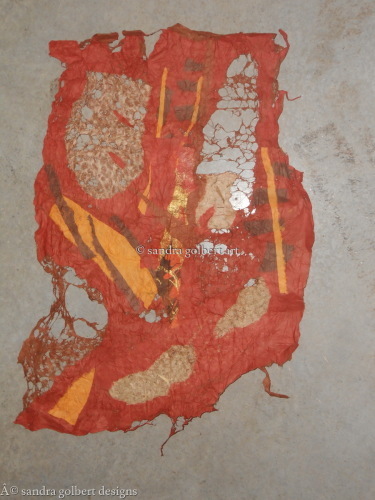 Hanging piece made up of silk pieces, dyed, cut, strung and anchored on a wire platform. These may be made to order. 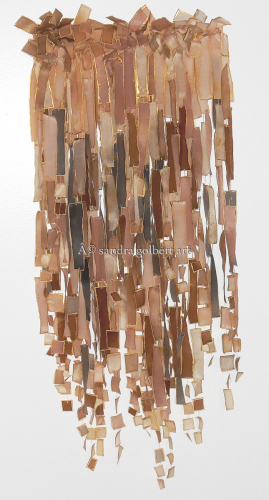 Hand-dyed silk wall piece with gold resist, in shades of beiges and browns.